Ahhhh, the joy of sleeping……sigh it’s a good thing! Although I think between the naps and the full night of sleep I have been averaging 10 hours a day, but I guess my body is just trying to catch up, but I do feel better! Next week I have some paperwork to finish up, stock rooms to organize and then its off for 9 glorious weeks! How did I ever manage a year round job before? But to tell you the truth, I have not had to physically work as hard as I do at the Mount in quite some time, and the Chef is no spring chicken that’s for sure! This is the time in my life when getting old looks so much better than the alternative. But enough of my whining, it’s (almost) summer time and the livin’ is gonna be easy! This is the time of year when I can truly be a locavore, or at least give it my best shot. Now it’s not that I don’t want to be a locavore, I see it as the best possibly way to live, it’s just really hard when your growing season runs from May until early November at best, and root vegetables are just not your favorite foods. 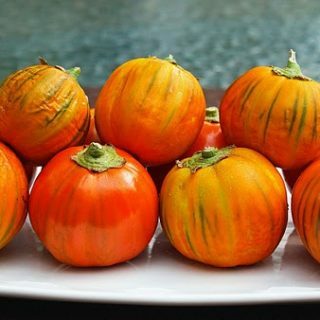 Years ago when the old chef practiced the art of Tang Soo Do, I tried to follow more of the Chinese philosophy on food, they were the original locavores, eat locally and eat only what is in season. How I do miss those days, and the training that use to keep me healthy and young…..sigh, again I digress. I have been trying to eat healthier, more fish, more veggies, less refined products. Now that’s probably the hardest battle to win, everything has refined products, additives and things I can’t pronounce! This is why we must read labels, and do our best to eliminate junk foods from out diet. Really though when you think about it, when your home, eating healthy becomes much easier, being able to control what goes into your meal puts you charge with no one to blame but yourself. Now all you have to do is make the right decisions, and while I buy organic and free range as much as I can, the reality is, it’s not always cost effective. But you can still eat well and eat healthy, even if you can’t afford the premium ingredients. This my friends brings us to today’s big splurge! 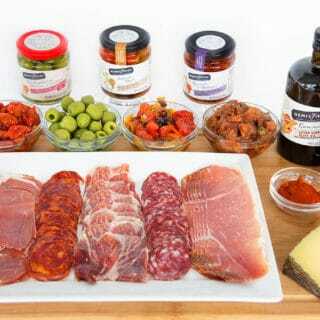 We really only splurge on one meal a week, and this takes the place of dining out, it’s good to keep this in mind, when your at the fish market, prices have gone sky high! That being said, you can still enjoy a wonderful meal at about one third of the cost of going out. Now you may not get all those rich fancy sauces, but we were trying to eliminate some of the extra calories anyway, besides trust me, they will show up in something later! This week at Wegman’s I didn’t see anything really priced right that excited me, I had already picked up a pound of jumbo lump (which did excite me!) and I knew I wanted to use it with what ever fish I ended up with. I decided on the fish so nice they named it twice Mahi-Mahi! Mahi is a nice meaty fish and holds up well when grilled, the trick with Mahi is to under cook it ever so slightly so as the Mahi sits it will finish cooking, timing is everything! Mahi by itself can be a little lacking in the taste department and it does need something to perk it up. I sauteed a little garlic in olive oil with a few grape tomatoes split, then added in my jumbo lump and tossed it gently so it wouldn’t break up. The dish could have used a little more sauce, or even dare I say a little butter to finish it off, but this was too be a healthy meal, so no butter was added. 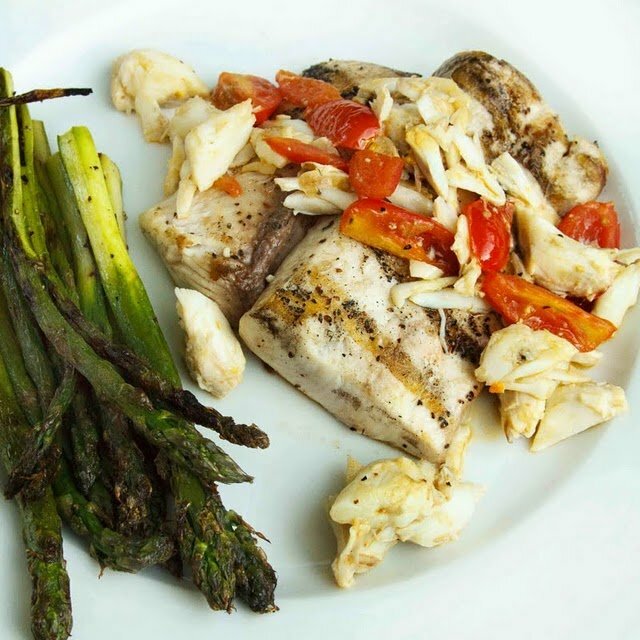 The asparagus were the perfect accompaniment to the flavors of the mahi and crabmeat, and our splurge for the week was well worth it. The rest of the crabmeat made an appearance as a mini splurge served in a aioli sauce over linguine, it was a good week to eat at home! 1. Start by preparing the mahi-mahi fillets, rub them down with olive oil and sprinkle a liberal amount of sea salt and black pepper on the fillets. Allow the fillets to warm up slightly before grilling. 3. While the Mahi is cooking add olive oil to a hot saute pan and then add the garlic and grape tomato halves. Allow to saute for 1-2 minutes, do not let the garlic burn! 4. Add in the crab meat and gently toss in the mixture. Remove from the heat until Mahi is finished. 5. Remove the Mahi from the grill and top with the sauteed crab meat, serve immediately with your favorite side dish and a squeeze of lemon. I like to prepare grilled vegetables the same way I do fish or meats, Olive Oil, Sea Salt and Black Pepper. Simple preparations and cooking methods let the flavors of what you are cooking take center stage, so you can really enjoy the meal. Thanks so much for stopping by today, I have some news that I will be sharing on Wednesday, so make sure you stop by and say hello on Wednesday. I do appreciate your time, and kindness, blogging has become such a big part of my life now, and I am very thankful to be part of this wonderful community of bloggers! Just a note, today is my 200th post, thank you all for your continued support and friendship, I couldn’t have done it with out you! Alright Chef, Ill trade you one of those manwiches for this meal (though it doesnt seem at all fair since this is faaar healthier) but crab meat scampi – ooooh my. I have got to try that. Complimenti chef dennis per il risultato raggiunto. davero sfiziosa questa ricetta, complimenti. Ciao Daniela. Hi Chef – we are huge mahi fans here! Fabulous idea to pair with crab. Ah, yes… the sleep! I'm working on a bit of a deficit myself, but in the next few days I'm planning to catch a few naps myself. The sun comes out in the afternoon (we have our usual June Gloom marine layer… fog most of the day – but usually get a break for a few hours in the afternoon). Glad you are feeling better! That end of year is always so busy. You've done a wonderful job on our favorite fish! 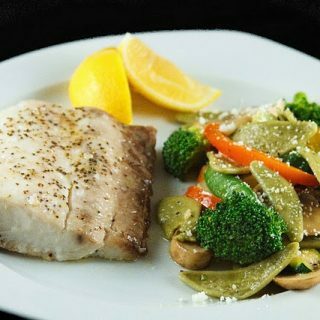 Mahi mahi is big around our household and we have it up to 3 times a week! Love the combo you've done! What a delicious-looking splurge! I love mahi-mahi and it's been far too long since I've eaten it. Congrats on your 200th post!! Yay for summer break! I've been catching up on sleep as well and it feels great. Speaking of great, this fish can visit my plate any day! Just gorgeous. I'll be in Delaware next week and we're taking a day trip up to Phili. I'll send you my cell number, I'd love to meet up! I'll have a couple kids and a friend with me, but if you don't mind that I'm all in! Chef Dennis, Congratulations on your 200th post!! I wish I was able to share a meal with you but how about a virtual hug for all your inspiration. I hope you and your wife have a wonderful week! 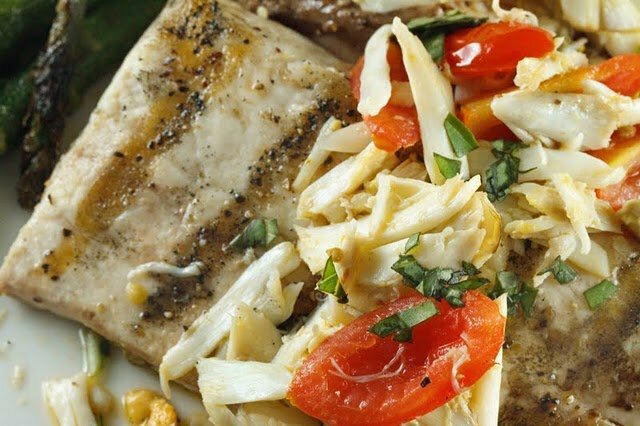 Love grilled seafood and this Mahi-Mahi and lump crabmeat looks amazingly scrumptious! And a very healthy meal, too! 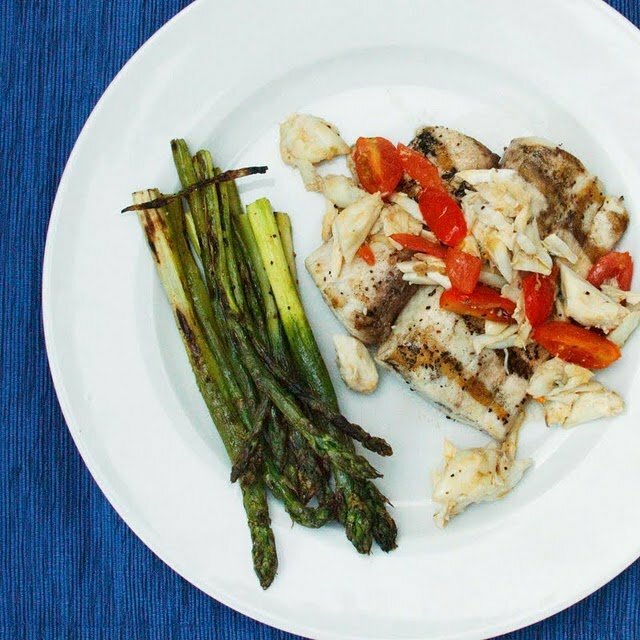 Thanks for sharing this wonderful recipe and congrats on your 200th post! Happy Summer! This looks and sounds so appetizing! I love grilled Mahi-Mahi, you did it very lovely! I can't wait to follow you in the next 200…you are such an inspiration. I am glad to see such a fresh and delicious fish recipe. This seems like heaven (and I know Ryan would adore it…he is such a fan of crab!) Thank you for sharing such an inspiring recipe. I want to get into my kitchen now. I hope you are having a beautiful and bountiful Monday! 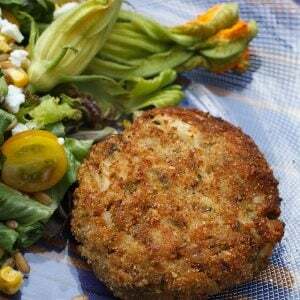 I saw crab and that's all it took my favorite and with Mahi a huge bonus great recipe~ congrats on all your posts! Congrats on your 200th post! That is amazing!! This dish is just…wow, it is to die for! So much so my heaven on a plate! 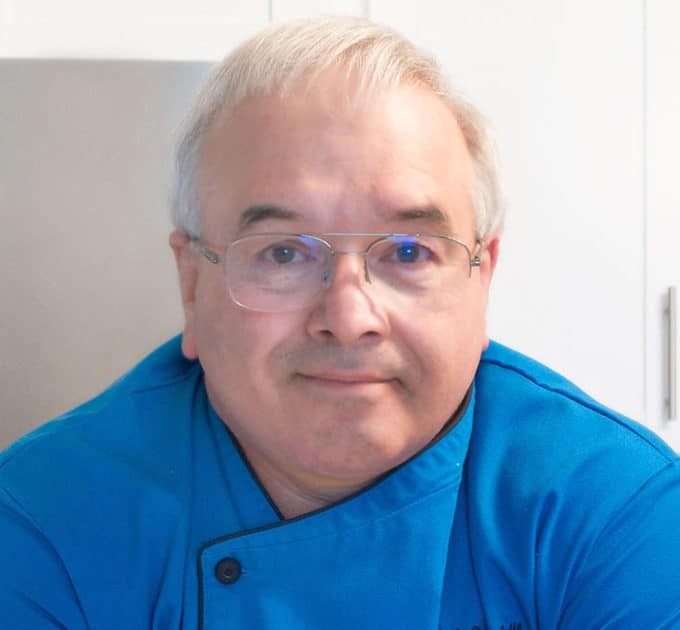 Congrats on your 200th post, Chef Dennis! Love your blog! The mahi-mahi looks fantastic! Love it. We love Mahi-Mahi. It really is a fabulous fish. Congrats on post #200! Congrats on the 200th post! A great one for the occasion. I really like mahi mahi but with the crabmeat it takes it over the top. Yummy! Enjoy your 9 weeks of bliss. Get lots of rest and sunshine! Congratulations, Chef, on the 200th post!! I, for one, am grateful for all those posts! The mahi looks wonderful, loving the fresh crab on top of it! Wow – 200 posts! Way to go, Chef. Love the look of the mahi-mahi and with the crabmeat. Absolutely fabulous and a real taste of summer. 9 weeks sounds heavenly. Enjoy! An evil combination to be sure… crab makes anything better… and I think grilling asparagus concentrates the flavor brilliantly! What a beautiful looking dish! You have really let the ingredients speak for themselves. I just wish I could get Mahi-mahi in Australia! Mahi-mahi is my new obsession! I've just had some in a nice restaurant in Greece and I'm so unhappy that over here there is none available. However, the good news is that there is a new restaurant close to home called… mahi-mahi! Nice photos & recipe, Dennis! Congrats on your 200th post, Chef Dennis! 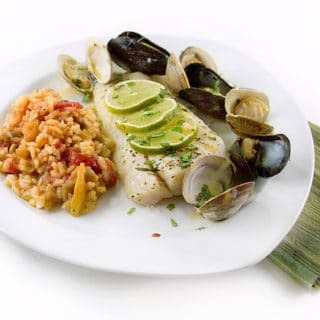 You are fabulous… I am so glad you get to sleep in these days 🙂 That plate of food would be one of my perfect meals… fish, crab and asparagus – a few of my favorite things! Thanks for sharing this recipe! Congratulations, Chef. You have done your 200th post and I'll be soon doing my 20th post, what a contrast! I have a lot to learn from you and I read your posts very attentively. Is there an easy way to extract crabmeat from crabs? Congrats on your 200th post. Great milestone. Can't wait to read the next 200. The fish looks great, I should have eaten more, well, maybe in the future. Congratulations on your 200th post Chef! I am looking forward to being more of a locavore when we return home at the end of the month. Here on Mauritius majority of all produce is imported to it has been difficult to eating locally. 200 down, 200 to go! Congratulations Chef…now you should have enough dishes to cover the 4 seasons of a restaurant menu! I'm with you on the grilling concept of olive oil, sea salt and black pepper – simple and easy, just the way summer living should be. Felicidades on your 200th post!! Congratulations on your 200th post, but more importantly on sharing your recipes and wisdom throughout! The mahi looks fabulous…but that roasted asparagus!!! It might have been a good weekend to eat at your house, but I'll never know…because I wasn't invited! : ) Looking forward to your next 200! Congrats on 200. Do you know I've been blogging for three years and I'm only at 91? lol Well..lots happened during these three years that led to nlog breaks, plus..I only blog about twice a month anyway. Now, your dish. 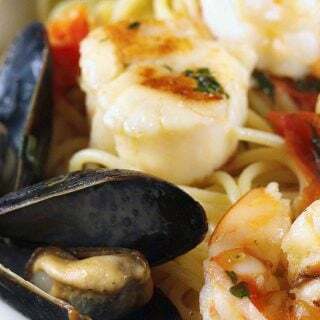 You had me at crab scampi. Give me anything 'scampi' and I'm a puppy in one's hand. It looks phenomenal, Dennis..beautiful execution and plating.